#3 - Where Is My Boyfriend? The Situation gets knocked out during a fight and Ronnie and Sammi wonder if their relationship is beyond repair. Snooki and Deena party too hard; Team Meatballs have a run-in with the Italian police. #6 - Cabs Are Here! Ronnie and Sam end their tumultuous relationship with a nasty breakup that prompts Ronnie to destroy all of Sam's belongings. Later, she considers leaving the shore for good. All of the roommates are focused on courting their current flames, but there is never peace in the house. One of the roommates causes drama with Snooki and Deena, while JWOWW's skimpy outfit creates a problem for Roger. 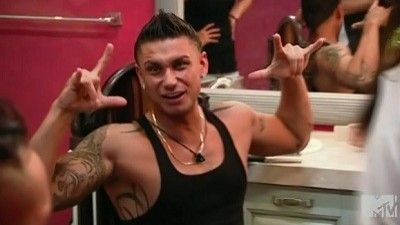 Deena once again is on the prowl for Pauly D. The Situation continues to instigate drama in the house and everyone turns on him and later in a club Team Meatballs are not treated well again and end up getting into another brawl. The roommates say goodbye to Miami and head home in the Season 2 finale. With twins in the mix, it's double trouble as bi-curious Deena pulls the robbery on both The Situation AND Vinny. Plus, The Situation's "secret hook-up" with Snooki is revealed. Is Snooki a cheater or is The Situation just trying to start drama? Vinny and Pauly D take a road trip to Staten Island. Roger becomes more than just a rebound for JWOWW. The Situation reveals Sammi's shady ways, causing Ronnie to question his love for her. Sammi returns to the house; Snooki's feelings for Vinny deepen; Mike believes a hook-up smells like cheese. The roommates say goodbye to another summer at the Jersey Shore. While one couple reaches a crossroads in their relationship, another couple makes it official. The roommates leave Italy and return to New Jersey. The cast heads to Miami in the season 2 opener, and the drama quickly heats up when Angelina crashes the party. Meanwhile, Ronnie and Sammi, find themselves in an awkward situation after their recent break-up. Things go south for Angelina when the house learns she slept with Jose after smushing Vinny. Then she gets too close to a guy Snooki hooked up with. But it's the last straw when The Situation discovers more unpleasantness in the bathroom. Mike returns and learns about Danny’s threat to find new tenants; the girls hire X-rated entertainment for Pauly and Mike’s birthday party; the gang heads to Staten Island in hopes of persuading Vinny to come back to the shore. The boys harass Deena for stealing a girl from Vinny's bed, leading her to anxiety and self-doubt about her relationship with the roommates. Ronnie and Sammi are back to their old ways, but this time The Situation is involved in their drama. The Situation reunites with his Canadian hottie, providing entertainment for the whole house. 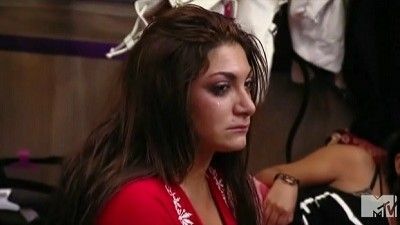 And Angelina tells her roommates how she really feels about them, sending Snooki into a frenzy and finally pushing things over the edge. Mike decides to reveal the truth; Pauly, Vinny and Deena struggle to be single roommates.